Traffic congestion presents a number of urgent problems in Nairobi, but smartphones and other technologies have the potential to greatly improve transport services and provide a range of benefits for city residents. Photo by Olli Pitkänen/Flickr. Many cities in sub-Saharan Africa are choking on their traffic, both literally in terms of air pollution and figuratively in terms of congestion. Nairobi, Kenya is no exception. However, new technologies, in particular new uses of smartphones, are helping to improve mass transport services. Manual data collection on the city’s transport routes mean information on transport systems has historically been sparse. Earlier this year, TheCityFix examined the openMatatus project, in which a team from MIT, Columbia University, and the University of Nairobi worked to change that by giving tracking-equipped smartphones to passengers on matatus – mini-buses that operate mostly under the radar within the city’s informal transport network. The study revealed that matatus do indeed follow routes, even though they are not properly marked, advertised, or known by non-users. Smartphone data was also able to determine average speeds along route segments. This kind of information is an essential starting point for transport planning. This is only one example of why GPS in smartphones has the potential to quickly improve mass transport at minimal cost, particularly as smartphones become more common. Congestion causes a number of urgent problems in Nairobi including pollution, strangulation of economic development, and poor traffic safety. The time is now to explore and adapt technologies that can improve the informal transport sector for the benefit of transport operators, passengers, and the city at large. There is a plan to install bus rapid transit (BRT) in Nairobi, but its implementation schedule is uncertain. It will require the creation of new governance structures to coordinate BRT with a formal feeder system, and even under the most optimistic scenarios, it will take many years before it can cover the entire city. In the meantime, informal transport services are vital for residents. Nairobi has already taken a number of steps to use existing technologies to improve the informal transport system, with mixed success. Nairobi recently passed a law that requires matatu crews to accept cashless fare collection methods (for example, the BebaPay smartcard). As entertainingly made clear in a recent New York Times video, the uptake of this law has been slow. Google provides cards for free, but requires users to open a Gmail account. The main reason for the slow uptake, though, is that drivers’ incomes come from a percentage of cash fare exchanges and they do not have the incentive to use cashless fare collection. To address rampant speeding and a poor safety record, speed governors – which are devices that measure and limit the speed a vehicle travels – were also made mandatory for matatus. However, there have been many disputes between the police and drivers as to actual speeds travelled. This highlights the need for reliable and accurate equipment if advanced technology is to gain acceptance, especially when law enforcement is involved. Creating a real-time map of all buses along a route used to involve a Computer Aided Dispatching/Automatic Vehicle Location system based upon an expensive dedicated digital radio system and mobile data terminals (MDTs). Now, however, much of this capability can be achieved by assigning standard smartphones to all mass transport vehicles. Phone apps also take advantage of crowdsourcing to provide real-time data of bus locations to improve users’ experience. Twende Twende is an application that also works on older phones and can send SMS messages to motorists about current traffic conditions near Nairobi’s 36 intersections that currently have CCTV. There are, of course, established international smartphone apps like Waze, and Kenya’s ma3route that use crowdsourcing. Only about 15% of Kenya’s population has access to smartphones, but this is expected to rise to one third of all Kenyans by 2017. Steadily improving crowdsourced traffic information can be combined with real-time matatu location data to estimate when the next matatu will arrive at a particular waiting location, (formal “stops” don’t always exist). Some matatus are also improving customers’ experience using on-board wifi, which could become increasingly common. Acquiring data about matatus through smartphones can also improve the city’s transport planning. Having real-time data can allow planners to detect bunching of vehicles and excessive gaps in the newly launched traffic control center. It can also help planners identify vehicles that are short turning – turning around before reaching the end of a transit route – or otherwise deviating from official plans. Planners can also couple GPS data with other technologies to improve safety. If covert alarm buttons are installed in matatus, the control center can direct law enforcement directly to where it is needed based on GPS data. This can be especially important at night, given that the city has almost no streetlights. Smartphones also open up possibilities for requesting signal priority for matatus by communicating with traffic signals using Bluetooth. This could serve as a powerful way to speed up mass transport even when bus-only lanes are not available. 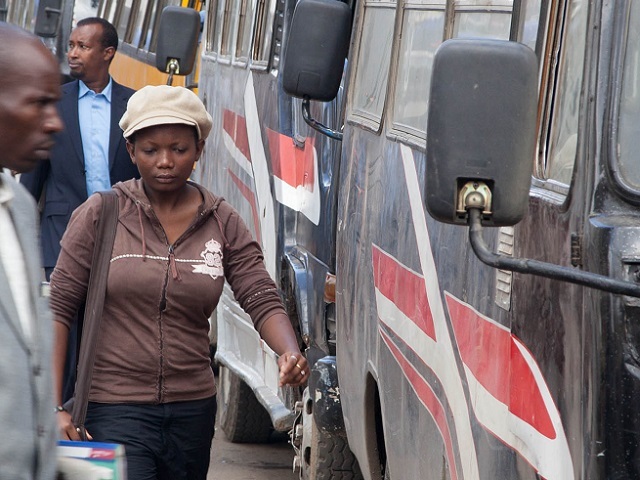 The smartphone revolution promises to bring near-term improvements to informal transport services in Nairobi. It can reduce rider anxiety. It can dramatically improve the productivity of limited enforcement staff. It can provide both government and individual firms with archived data usable for statistical analysis. Perhaps most importantly, when the positive impacts on the city become clear, it will make requests for further enhancements to the public transport system more persuasive.